I have to admit, every Thursday (yes, I am a procrastinator) when I start to prepare this post, I get pretty excited that it is the day before Friday. It makes me feel like I am THAT much closer to the weekend! And this week seemed to go by exceptionally fast. Monday was a holiday for most and even though I had to work, we were closed, so the day flew by and I was super productive. And now... it's Friday! I'll be honest. I don't really buy nail polish. I'm more of a "go to the nail salon and get my nails done" kinda girl. I've definitely tried the cheaper route, but let me tell you, it's not pretty. In fact that last time that I tried to paint my own nails, Seth said "what happened to you???" LOL. Yeah, it's bad. But when I was at Target last week and saw they were having a sale on Essie nail polishes, I knew it was my time to try them. After all, you can always bring your own nail color to the salon, right? So I took advantage of the buy 2, get one free sale, and picked up these goodies. I think I'm in love! Amazon Fire TV + Sling. Thinking about canceling cable and getting Amazon Fire TV. Does anyone have one? Thoughts? Likes? Dislikes? Our HOA pays for basic cable so we would still have those channels plus Sling ($20 a month) would give us channels I would be missing like HGTV (!!!) and many others. The only think missing would be baseball for Seth but we are trying to figure that out now. I've been talking about switching for a while, but we've never fully committed. I think March might be our month! Saving $50 a month by canceling is too good of a deal to pass up. We had the best Valentine's Day weekend! If you didn't catch it, I shared some super cute starburst puzzle valentines on Monday that we made for a little valentine exchange with some blog friends! You guys, WE DID IT!!!! We officially completed a whole Whole30! We officially finished on Tuesday night (I will be sharing Days 21-30 and our results soon) and I couldn't be more proud of us! We feel super good and while I am enjoying the fact that I can eat a muffin for breakfast and use creamer in my coffee, we are trying to stay on the same healthy food path from now on. I don't think we will continue on the Whole30 path forever (it is far too strict to do all the time) but we are thinking we might go more paleo. If anyone has healthy and/or paleo recipes that they really like, please share! 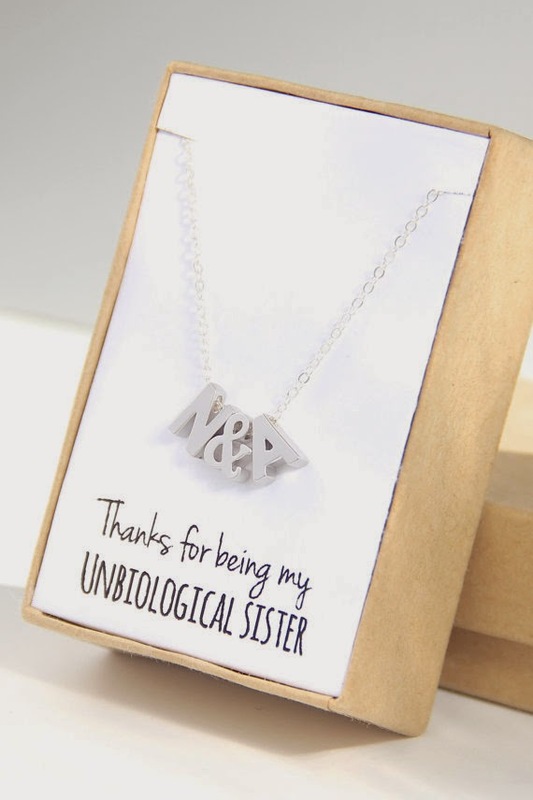 I've been searching for an initial necklace for FOREVER. I find some that I like but then I am indecisive and don't get it. Then I find another and same thing. I originally wanted one just with an "M" for Mason but now I kinda like the 2 letter ones. I'm sure it's for your 2 kids, but I almost think i would like that kind but with an "M" and an "S". And if there could be a heart in the middle, that would be perfect! I'm obsessed with initial necklaces too and I'm pretty indecisive about which one to actually buy! Have a great weekend! I am still in love with those cutesy little valentine cards. Plus I kinda love Starburst :). That necklace is super cute too. Have an awesome weekend dear! That necklace is so cute! We don't have cable... haven't since we've been married. We have netflix and amazon prime and that's it. We have a sony box which is kind of like a rouku. We also have the little google thing you plug in to the TV, though you can't do prime on that, hence why we still have the sony box. I think you'll be happy you made the change. Oh wow I LOVE that valentine idea!!! I may have to use that next year! I pretty much only ever write my posts the night before I publish them :) procrastinators unite! Haha I'm TERRIBLE at painting my nails (hence NEVER having my nails painted)!! I've heard of so many people lately cancelling cable and going with a subscription instead. Having the basic cable would be good enough for me to save $50, but we really don't watch that many shows. Check out Stella & Dot for some cute personalized pendants (I'd get a chain somewhere else cause they are a little expensive, I think). Ps- go Kendra Scott for the initial necklace! Hearts and letters! And reasonably priced! Love love love those valentines you made...good work mama! So much fun to play with and then of course to eat! =) And loving those nail colors together! I like that necklace a lot! We don't have the Fire TV, but we do have an Apple TV. I like it, but had we not gotten it for free, we'd probably get the Amazon one. That combined with Hulu and Netflix gives us 90% of what we watch. We haven't had cable in 5 years :) I say go for it! CONGRATS on finishing whole30! I know how hard you've worked at it and I'm very proud of you for doing it!! A heart in the middle of that necklace sure would be perfect! Speaking of perfect, the polish colors you liked out are beyond perfect for Spring!! Oh girl! I can totally help you out with the sweet side of paleo! I'll try to gather some links later! I am in love with that color on your finger nails!! And how did I miss the Essie sale at Target (I'm there basically every day!)?? Tell me more about this Sling you speak of. We have been tossing around the idea of ditching cable - it is SO expensive - and we are constantly looking for reasonable ways bring that cost down. We can't cancel cable either because of sports! If you figure that one out let me know! I've never hear of the Amazon Fire TV. We're obsessed with Amazon so it would only make sense. Ha! Yay for Essie! I love all of the colors you chose!! I love that initial necklace. So pretty and simple! Is that Essie polish color Double Breasted Jacket??? That's one of my new favorites. It look so similar. What color is the light pink? It looks really nice on you! Hope you're having a great week so far! Thanks for linking up with us at H54F!! You have pretty feet and hands! And those polishes are so pretty! Those Starburst puzzles were the best!! And great job to you and Seth on completing the Whole30! Kuddos to you guys. That takes some strong determination!! I have been wanting one of those initial necklaces for the longest!! We always talk about getting rid of cable, but then we wouldn't get baseball games and that is a no-go in our house! [A Year of Dates] February. [It's the Little Things] Boys with Strollers. The Words You Never Want to Hear a Doctor to Say.